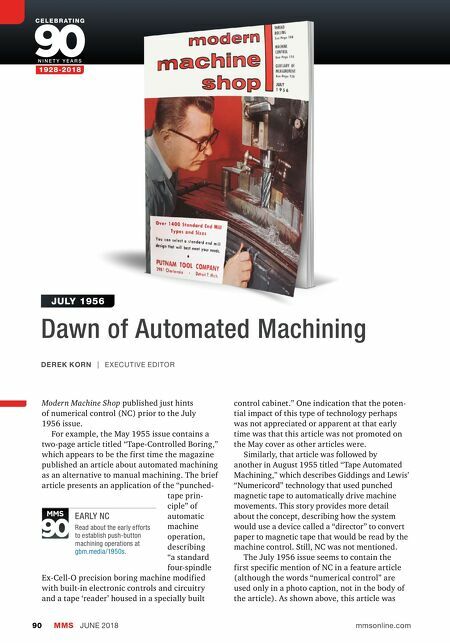 Modern Machine Shop 91 2010s 2000s 1990s 1980s 1970s 1960s 1950s 1940s 1930s AUTOMATING MACHINING cited on the cover that month, however, it was simply referred to as "Machine Control." The article is titled "Automatically Controlling Machine Operations," and its subhead sums up the promise of this new technology. "A control tape produced on a planning desk in one city could be duplicated by telephone anywhere in the world, placed in a machine control unit, and production of the part immedi- ately started." The automated machine control technology was developed by Electronic Control Systems, a subsidiary of General Dynamics Corp., and dubbed "Digimatic." The article seems to be based on information gleaned at a public demonstration of its "push-button factory control system" capabilities. It explains that the system was not just well-suited for large operations, but also would be appropriate for small- and medium-size shops. The idea was that Digimatic capability could be added initially to only one machine to enable shops to "approach automation cautiously and well within the limitations of their budget," as the article explains. The Digimatic used a "planning desk" with decimal computer and tape recorder to create the magnetic tape that was read by a control unit attached to a modified milling machine. A control unit would sufficiently amplify the elec- trical impulses recorded on the tape to operate the three servomotors added to the machine to enable automated control of the machine's X, Y and Z axes. This magnetic-tape method was one of a few different approaches to NC developed at that time. Ultimately, the industry settled on the punched-tape method. Regardless, machining parts without an operator manipulating hand- wheels had to be an "out-there" concept at the time. It is not surprising that the writer of one of the first articles about automatic machining referred to this new capability as both "myste- rious and startling." 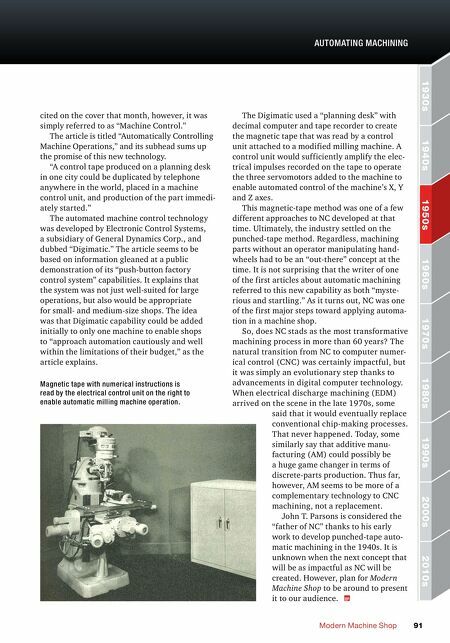 As it turns out, NC was one of the first major steps toward applying automa- tion in a machine shop. So, does NC stads as the most transformative machining process in more than 60 years? The natural transition from NC to computer numer- ical control (CNC) was certainly impactful, but it was simply an evolutionary step thanks to advancements in digital computer technology. When electrical discharge machining (EDM) arrived on the scene in the late 1970s, some said that it would eventually replace conventional chip-making processes. That never happened. Today, some similarly say that additive manu- facturing (AM) could possibly be a huge game changer in terms of discrete-parts production. Thus far, however, AM seems to be more of a complementary technology to CNC machining, not a replacement. John T. Parsons is considered the "father of NC" thanks to his early work to develop punched-tape auto- matic machining in the 1940s. It is unknown when the next concept that will be as impactful as NC will be created. However, plan for Modern Machine Shop to be around to present it to our audience. Magnetic tape with numerical instructions is read by the electrical control unit on the right to enable automatic milling machine operation.